There was a large arena on campus, one that seated 8,500 people. But it was so large, there was no way they could make that work, and no way they could afford it. 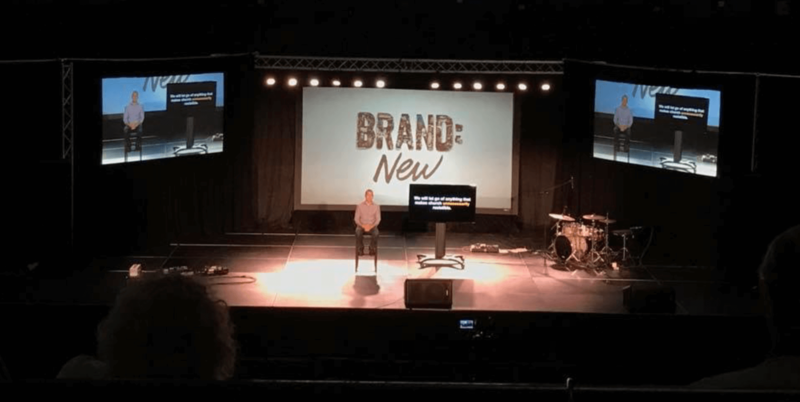 Journey Church was out of space and out of ideas. The Intentional Churches team arrived in May 2016 to lead the Journey team through an Intentional GrowthPlan (IGP), a plan that would have Kingdom impact for Calloway County where Murray is located, and a plan that would ultimately fulfill Matt’s bigger vision of reaching the surrounding counties in the next five years. With little persuasion, the church rallied around this exciting decision and immediately began spreading the word and inviting others. Journey held a 30-day prayer focus and themed it “A Seat for Everyone.” With 8,500 seats, each seat represented three people in the county who were not attending church. As part of the prayer focus, Matt asked church members to write down the names of three people they’d like to see there. Behind-the-scenes, Journey quickly raised funds for the new A/V equipment required for an arena, an arena they only planned to occupy for four weeks. It was definitely a courageous step of faith by the Journey team, and only God could have orchestrated the days leading up to the move. “The Saturday night before our first Sunday, we held a vision night and offered tours of our new, but temporary, church facility, with 5-minute stops in each environment. The next day was unbelievable! In fact, during the next four weeks, we experienced our four highest attendance weekends ever. It was amazing!” Matt said. In January, Journey made a permanent move to the arena and experienced a 45% jump in attendance when compared with the previous year. And along with it, an increase in generosity of 18%. At this writing, the Journey has already maxed out their kids’ space which has accelerated their search for another permanent location. The Intentional Churches team is celebrating Journey Church and their unwavering faith in action, and we look forward to helping them accomplish their 5-year vision as they continue to fulfill the Great Commission.